Vehicle insurance is impacted by many different influences– from something as minor as a decade-old fender-bender on your record, to something as major as industry-wide trends across insurers or manufacturers. One of the more overlooked areas is simply how much and how far a vehicle is driven on a day-to-day basis. Have you noticed anytime you get a vehicle insurance quote, you are asked how many kilometres you drive each day? This is one way insurance companies and brokers estimate the risk of insuring your vehicle. For more information on this, keep reading for a brief summary of how mileage affects your vehicle insurance. 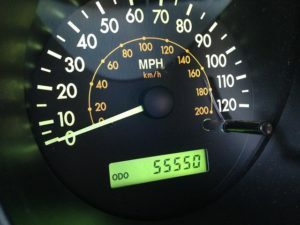 While Canada and 99% of the world uses the metric system, many English-speakers still use the term “mileage.” Mileage originally described the average amount of miles you could expect to get out of a single tank of fuel, but the term is still used in areas that measure exclusively in kilometres. Insurance companies will estimate your vehicle’s risk of liability according to your own mileage estimates, so be accurate! Also, note that driving your vehicle less does not always mean lower premiums. It is not just how and when you use your vehicle, where you use it can be just as or even more important when calculating your insurance coverage. Dense and rural areas both present their own unique problems, all of which are considered by your insurer. This is a situation that you have little control over, unless you plan on relocating to suit your vehicle insurance! In Alberta, most of us rack up our time on the road commuting to and from our professional responsibilities. Whether you are on the highway or in the city, use of a vehicle to support full- or part-time work can be a main influence on your insurance premiums. One of the easiest ways to reduce this burden is by seeking alternatives such as carpooling or public transit. You should always make sure that your insurer is working with your latest information– changes in your personal and professional life that alter how much you drive your vehicle should be reported as soon as possible. Review your policy with your broker or representative regularly, as this may reveal possibilities for expanded coverage or even lower fees! ARC Insurance is happy to provide the summaries above, but it is no replacement for a comprehensive assessment from our friendly staff. Contact or visit us today!